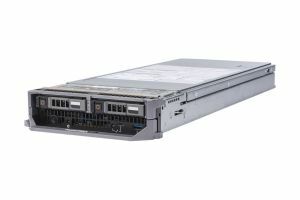 The Dell PowerEdge M640, dual socket, half-height blade server, is ideal for XaaS, private cloud, and HPC applications. Supporting 2 x Intel Xeon Scaleable CPU's, the M640 has 16 x DDR4 DIMM slots and 2 x hot-swap 2.5” SAS/SATA/SSD/NVMe SSDs drive bays. As with all our used Dell servers, our refurbished PowerEdge M640s can be configured to meet your specific requirements. The PowerEdge M1000e chassis enclosure allows the installation of up to sixteen PowerEdge M640 blades while four M640 blades can be fitted into a PowerEdge VRTX chassis.